The popular Dr. Müller Pastilles differ from each other in the balanced combinations of herbal extracts which they contain. Honey and vitamin C improve their taste. Vitamin C contributes to maintain the normal function of the immune system and to the reduction of tiredness and fatigue. 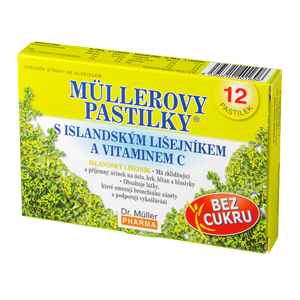 Dr. Müller Pastilles are suitable for adults and most of them also for children and you can combine them well Dr. Müller Syrups and Dr. Müller Teas. Composition: Isomalt, black currant juice, aroma (black currant), acidity regulator (citric acid), zinc gluconate. Dissolve 1 pastille in the mouth (adults 6 times a day and children 3 years and up 3 times a day). Composition: Isomalt, Iceland moss extract [purifi ed water, maltitol, Iceland moss (Cetraria islandica)], herbal extract (purifi ed water, mixture of herbs, maltitol), ascorbic acid, anethol, sweetener (acesulfame K), menthol. Dissolve 1 pastille in the mouth several times daily (adults and children aged 3 and up). Composition: Isomalt, sage leaf extract [purifi ed water, sage (Salvia officinalis L.), maltitol], herbal extract (purifi ed water, mixture of herbs, maltitol), ascorbic acid, essential sage oil, sweetener (acesulfame K), menthol, anethol. Dissolve 6 (adults) or 3 (children aged 3 and up) pastilles in the mouth 3 times daily. Do not exceed the recommended doses. The product does not substitute varied diet. Excessive use can have laxative effect. Not suitable for children up to the age of 3. Not suitable for pregnant women. Keep out of the sight and reach of children. 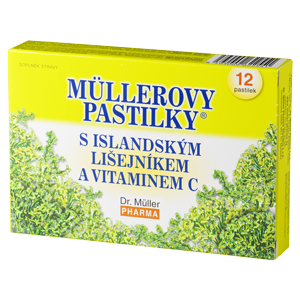 Dr. Müller Pastilles with Iceland Moss and other herbal extracts. 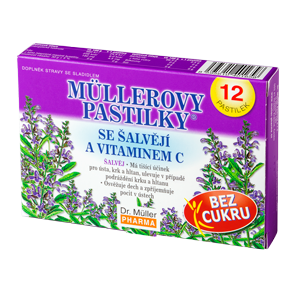 Honey and vitamin C improve the taste of the pastilles. Composition: Saccharose, sweetener (glucose syrup), Iceland moss extract [glucose syrup, purifi ed water, Iceland moss (Cetraria islandica)], herbal extract (purifi ed water, mixture of herbs, honey), honey, ascorbic acid, menthol, anethol, Eucalyptus oil. 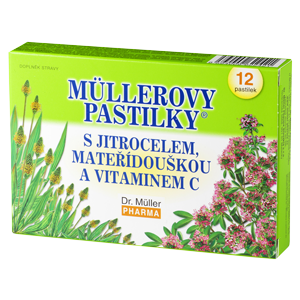 Dr. Müller Pastilles with plantain, wild thyme and other herbal extracts. Honey and vitamin C improve the taste of the pastilles. Composition: Saccharose, sweetener (glucose syrup), ribwort plaintain leaf extract [glucose syrup, plantain (Plantago lanceolata L.), purifi ed water], wild thyme herb extract [purifi ed water, glucose syrup, wild thyme (Thymus serpyllum L.)], essential thyme oil, honey, herbal extract (purifi ed water, mixture of herbs, honey), ascorbic acid, menthol. Dissolve 1 pastille in the mouth 6 times (adults) or 3 times (children aged 3 and up) daily. 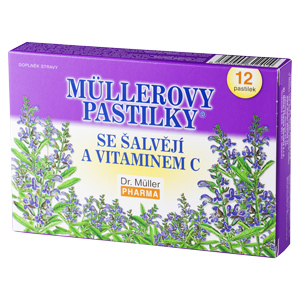 Dr. Müller Pastilles with Sage and other herbal extracts. Honey and vitamin C improve the taste of the pastilles. Composition: Saccharose, sweetener (glucose syrup), sage leaf extract [purifi ed water, sage (Salvia officinalis L.), maltitol], herbal extract (purifi ed water, mixture of herbs, honey), honey, ascorbic acid, essential sage oil, menthol, anethol. Do not exceed the recommended doses. The product does not substitute varied diet. Not suitable for children up to the age of 3. Not suitable for pregnant women. Keep out of the sight and reach of children. 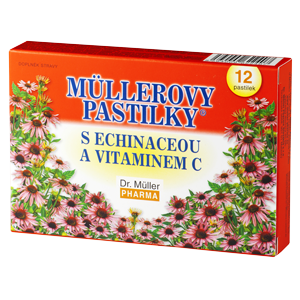 Dr. Müller Pastilles with Echinacea and other herbal extracts. Honey and vitamin C improve the taste of the pastilles. Composition: Saccharose, sweetener (glucose syrup), echinacea extract [glucose syrup, purifi ed water, echinacea (Echinacea purpurea)], herbal extract (purifi ed water, mixture of herbs, honey), honey, ascorbic acid, menthol, anethol. Dissolve 3 (adults and children aged 3 and up) pastilles in the mouth several times daily. Do not exceed the recommended doses. The product does not substitute varied diet. Not suitable for pregnant women and breast-feeding women. Not suitable for children up to the age of 3. Keep out of the sight and reach of children. 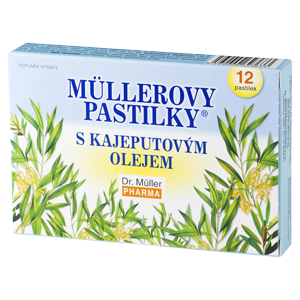 Dr. Müller Pastilles contain Tea Tree oil. Composition: Saccharose, sweetener (glucose syrup), Tea Tree oil, peppermint oil. Dissolve 1-2 pastilles in the mouth 3 times daily, best after meals. Dr. Müller Pastilles contain the essential cajeput oil. Composition: Saccharose, sweetener (glucose syrup), cajeput oil, peppermint oil. 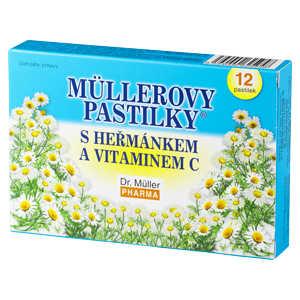 Dr. Müller Pastilles with Chamomile and other herbal extracts. Honey and vitamin C improve the taste of the pastilles. Dissolve 1 pastille in the mouth 1-3 times (children aged 3 and up) or 1-6 times (adults and children aged 12 and up) daily. 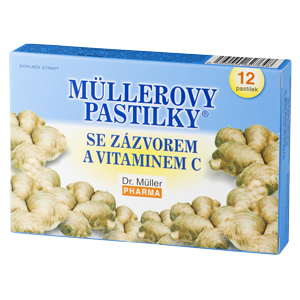 Dr. Müller Pastilles with ginger and vitamin C. Honey and vitamin C improve the taste of the pastilles. Composition: Saccharose, sweetener (glucose syrup), honey, ascorbic acid, ginger extract. Dissolve 1 pastille in the mouth every 3-4 hours, adults max. 6 pastilles daily; children aged 10-15 max. 5 pastilles daily; children aged 3-10, pregnant and breast-feeding women max. 3 pastilles daily. Do not exceed the recommended doses. The product does not substitute varied diet. Not suitable for children up to the age of 3. Pregnant and breast-feeding women can use the product only after consulting a physician. Keep out of the sight and reach of children.